Well, technically I have made bread before, but these are the first loaves I have made where I had a clue what was happening. I followed Hamelman's recipe (Bread:Pg 113) pretty strictly with the exception of baking. I started with a cold oven instead of preheating and I didn't use any steam or water in the oven. 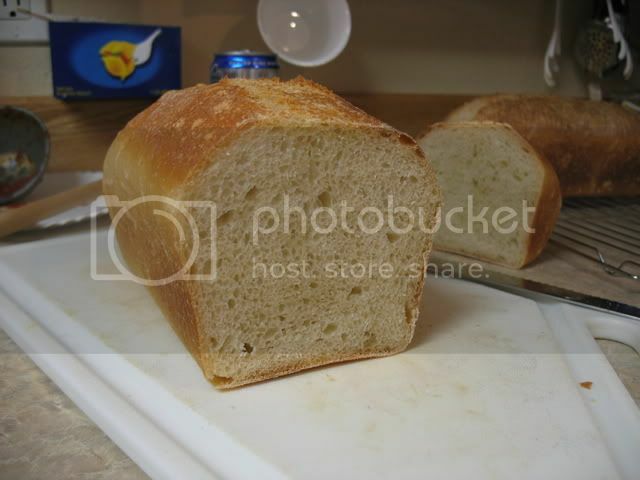 The recipe is a basic white bread made with a Biga that I prepared the night before. This was also my first time using my new mixer, a Bosch Compact Kitchen Machine (450W version). I have not tasted the loaves or cut them open yet as they are still cooling, but I am very pleased with the results thus far. Both loaves were baked in loaf pans of slightly different sizes. 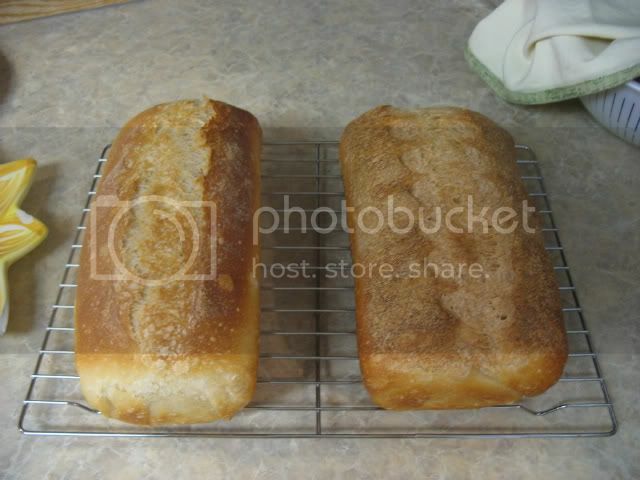 The loaf on the left was made in a loaf pan that was a bit slimmer and longer than the loaf on the right. 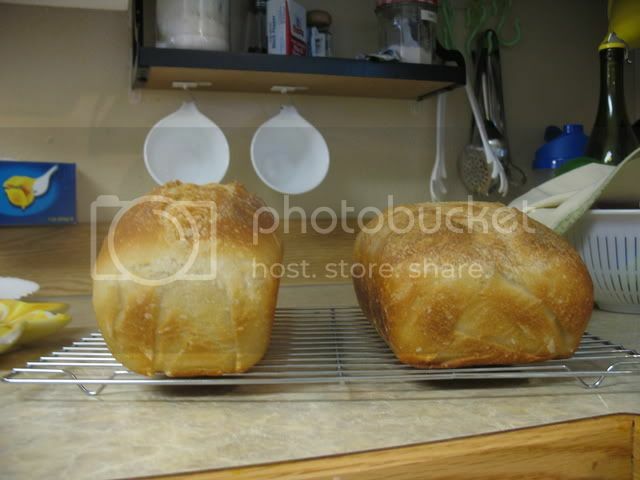 Also the loaf on the left was baked inside a small turkey roaster for the first 30 minutes where the loaf on the right was baked straight on the rack inside the loaf pan. Some of the extra lift of the left loaf was due to the narrower loaf pan but I do think baking it inside the roaster helped the lift a bit. I haven't cut them open yet so I don't have any pictures of the crumb. I will try and post them later. In addition to Jeffrey Hamelman's book, Bread, this site has been of great help to me. Hope you enjoy the pics. Having a clue is a good thing. You'll find this place is full of 'em. When you cut your nice looking loaves, it will be interesting to see if the crumbs look different. Thanks David. There certainly is a wealth of knowledge here. I cut open one loaf so far. I am not very pleased with the crumb. It has a pretty tight structure and it also seems that I under-baked it a bit. I did check the temperature and it read about 205F. It tastes good and makes an excellent toast. You can see marbling in the crumb here a bit where it didn't completely finish baking. It is a rather dense loaf, though still quite tasty. I used Bob's Red Mill unbleached white flour. I think I may try KA organic AP flour next time. I think on my next go around I will try a wetter dough, perhaps a Ciabatta or something similar. I also plan on activating my sourdough starter sometime in the next week or so. I am really looing forward to trying a sourdough bread.